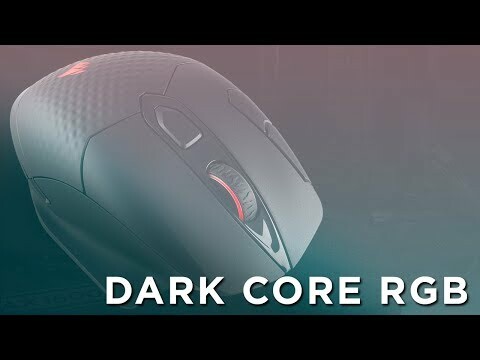 DARK CORE RGB features ultra-fast 1ms wireless, Bluetooth® compatibility and wired mode for performance gaming with versatile connectivity. The high-accuracy, 16000 DPI optical sensor, customizable in 1 DPI steps, can be tuned to virtually any mouse pad. The comfort-contoured shape and 2 interchangeable side grips ensures precision and control. On-board profile storage, programmable through CUE software, saves RGB lighting effects, macros and DPI settings for easy access to your settings. Up to 24 hours of battery life and continuous use through USB charging while gaming. The durable Omron switches are rated for 50 million clicks to provide ultra-fast response and reliability over time. 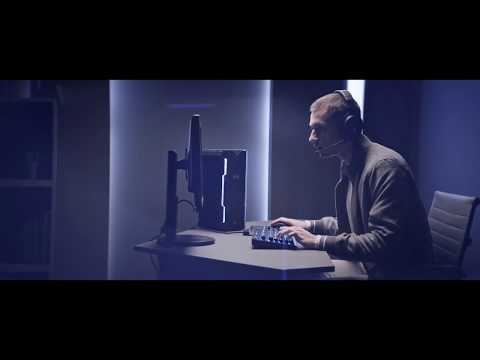 • Ultra-Fast Wireless and Wired Modes: Connect using ultra-fast 1ms 2.4GHz gaming-optimized wireless technology, low latency Bluetooth® wireless, or USB wired. • 100% CHERRY® MX Mechanical Keyswitches: Gold contact CHERRY MX Red mechanical gaming keyswitches deliver the ultimate performance and competitive advantage. • Lighting Control and Large Font Keycaps: Experience customizable dynamic and vibrant per-key blue backlighting. • Strong Wireless Encryption: 128-bit AES encryption mode helps protect your keystrokes from wireless eavesdropping to keep your personal data safe. • Compact and Portable: Tenkeyless form factor saves valuable desk space and makes travel easy. • Long-Lasting Battery: Up to 15 hours of rechargeable battery-powered wireless, or connect via USB wired for uninterrupted gameplay. • Dedicated Volume and Multimedia Controls: Control to adjust audio on-the-fly. • 100% Anti-Ghosting with Full-Key Rollover: Ensures your commands and simultaneous keystrokes always register the way you intended. • Programmable with CUE: Assign macros to any key and customize dynamic lighting effects with CORSAIR Utility Engine (CUE). • Windows Key Lock Mode: Prevent accidental Windows and Context Menu key presses. • Detachable Soft-Touch Wrist Rest: The comfort to enhance your gameplay. 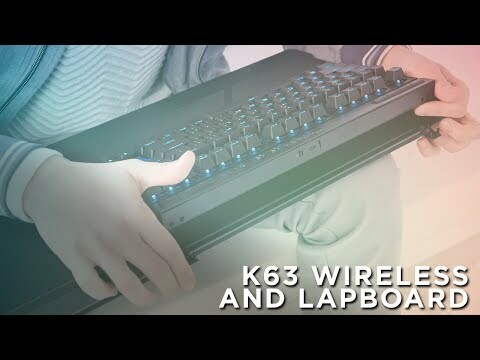 • Living Room Gaming Ready: Combine with the K63 Wireless Gaming Lapboard (not included, available separately) to create the ultimate go-anywhere desktop experience. • Desktop Calibre Experience: Bring full PC gaming control to your living room with the K63 Wireless Mechanical Gaming Keyboard and a full-sized mouse pad. • Ultimate Portability: Lightweight and perfectly sized to travel easily between rooms. • Memory Foam Cushion: Provides support while keeping the lapboard perfectly positioned on your lap. • Built-In Wrist Rest: No-slip surface keeps you stable and comfortable during long gaming sessions. • Replaceable Mouse Pad: Cloth surface mouse pad stays secure for pixel-precise tracking and can easily be replaced. 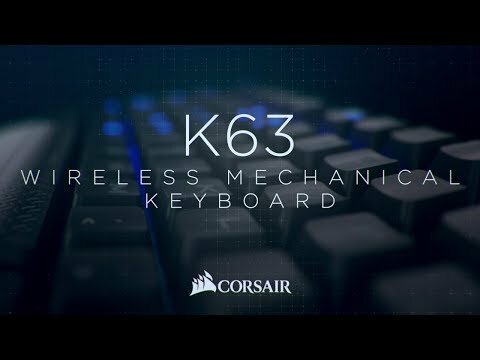 • Tool-Free Convenience: K63 Wireless Mechanical Gaming Keyboard effortlessly snaps in and out of the lapboard. Corsair K63 Cherry MX Red Wireless Mechanical Keyboard + Dark Core RGB Wireless Mouse + K63 Wireless Lapboard Bundle is rated 4.5 out of 5 by 2. Rated 5 out of 5 by Rossyk from Expensive, but lovely! Expensive keyboard and mouse bundle but I'm really impressed with them so far. So many options fgor using them its unreal! Rated 4 out of 5 by Whitemonk from Well built combo Bought this lapboard combo to control my lounge PC. Bit of an overkill as I'm not a gamer, but it is best of breed and has to be up there with other 'lounge' furniture. It'll take me a while to get used to the new mouse and keyboard, but I don't regret my purchase. My one small niggle is that this combo requires both of my front panel USB sockets, whereas my previous mouse/keyboard combo only required one. So had to buy a separate USB charger to recharge both devices.